We are about to enter the season of “Peace on earth and goodwill toward men (and women).” Oh, how I wish the concept was reality. We have suffering in our land. Families are struggling through the worst financial disaster of our times. Those on food stamps have reached an all-time high. The number of school kids on lunch assistance has reached record levels. Many families are without adequate medical care due to the high cost of insurance and medical services. Home foreclosures are forcing families out of their homes due to falling home values and the inability to refinance upside down mortgages. All around us we can see despair and lost hope by those hit hardest by our country’s recession/depression. Where is this Peace on Earth? We Lions are used to seeing people in need because “We Serve” them. Across our district, Lions Clubs are delivering food baskets, staffing food banks, and providing assistance where we can. Not all clubs have the resources to do huge projects, but from all the clubs I have visited, they are all helping make a difference in their communities in their own way, to the extent they can. We Lions can’t solve the unemployment problems or the recession in our country, but we can and do help those affected by our nation’s problems. It is in the eyes of those we help and in the thank yous we Lions get from those who just received a pair of glasses or a food basket or financial assistance for an eyesight related condition. They not only receive help but also the dignity of knowing that someone cares and that they have not been forgotten. But you know, the best part is the good feeling we Lions get from knowing that we do make a difference in the lives of others. 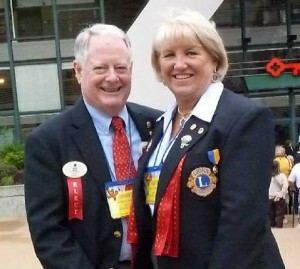 I am truly honored to be serving you as District Governor because I am getting to meet the most generous people in East Tennessee, the individual Lions of District 12-N. You freely give of your time, your talents and your money to help your community all through the year. I have seen the vastness of what our district is doing. You are living examples of what our founder, Melvin Jones, envisioned when he conceived our great association. I offer my sincerest gratitude to you for what you do for your communities. Paulette and I wish you and your families all the best this holiday season. Yes, there is Peace on earth and goodwill toward men (and women) because you serve.